The first couple of batches of flies, back in early 2009, I hand-branded the corks, distributed the flies among the vials and packaged them myself. It was a pain! I had this firm idea that I wanted to package the flies in a unique way, more specifically I was thinking in vials. As I worked with my designer we thought it would be pretty cool to have the top of the corks with our logo, and to add character to it it would be branded with a hot-iron. I imagine that’s probably how the word “branding” came to be applied to marketing. But, the idea of personally hand packaging flies didn’t fit with the goal of having a business that was independent of me. You see, I created Tenkara USA to go fishing, not to stay inside all the time. So, for the next few batches of flies that year I kept hiring people who lived nearby through Craigslist. This was at the height of the recession, and in a way it was a bit heart-breaking to put up a post looking for someone to do a pretty small job and get 30+ responses overnight. While that worked out ok, it was hard to manage; people would be available once but maybe not the next time, and I’d have to train them again. There had to be a better way. So, I started looking around for a firm that could help me accomplish the task quickly, efficiently, with backups and training and at low cost. After much searching I found the perfect partners to work with. Arc Commercial Support Services is a non-profit organization in the Bay Area that hires people with special needs to complete various tasks needed by businesses. They were a gem of a find. The workers have been phenomenal, with an error rate that would be hard to match, and a disposition to take on any job with a smile. It’s been fun to visit them a few times. Every time I go by they are working hard, but seem to be playing around with each other too, smiling and laughing. The vibe in the place is pretty cool. I have seen them packaging our flies, hand-winding our older level lines, and packaging various other items such as our rods, nippers and line holders, and it seems like they always come up with good ways to make the process more efficient than I could. The cost of doing this has not been any higher than it would have been to do it myself (much lower, actually). And, the cost of the packaging materials plus the labor are is just about the same as if we chose to stuff the flies in small plastic boxes. So, while some people may think our flies are expensive because of the packaging they come in, that is not the case. The efficiency of these workers translates into a very affordable way of packaging the flies (our cost of picking-and-packing/fulfilling is the main reason they get pricier). But the final product is unique and, I may even say, very cool. As we have grown we have brought in more projects and more volume for them, helping employ several people that would have a hard time securing jobs elsewhere, especially in this tough economy. It still baffles me how many flies we sell, it was never my intent to sell that many flies – they are easy to tie after all. But, I won’t complain about it of course. 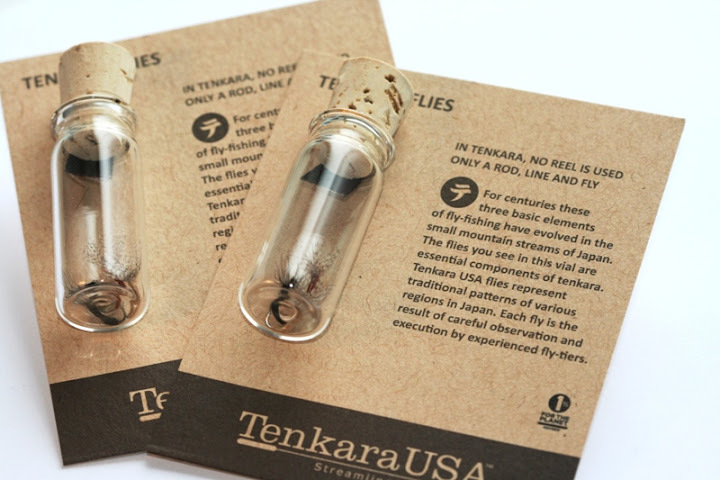 The folks at Arc CSS have kept the process consistent and have given us the ability to scale our operation as more and more people get interested in tenkara. Maybe in the future I’ll have to see about getting them to tie our flies as well, I’m sure they would do pretty well and probably have fun with it. 11 Responses to Who puts all the flies in those little vials? Love this write up, really shows everyone can be a part of something. Now where can I get a case of the Amano Kebari. LOL It’s my go to fly an I think I bought you all out. Have to say those vials are super durable as I have dropped them on the floor a couple of times and never had one break yet and the packaging is super unique, so much so that once I take the flies out the wife repurposes them for other things. Thanks for the comment Craig. We’ll have to work on cases, I’m sure the folks there will be happy with that! I don’t know what’s cooler. The packaging the flies come in or the fact that their sales go to not one, but TWO good causes: employing people with special needs and 1% For the Planet. Nice to see philanthropy in business. Thank you Jason for the reminder about 1% for the Planet. My grandpa always told me, “you can’t eat money”, so I do find it nice to spread it the best way I can. That is a neat business they have and a great solution for you while being able to keep tabs on production as well as employing Bay Area folks. Great find. Hey Zack, indeed a great find. It has freed up a bunch of time for sure. I’ll be watching for the case option. With 3 of us using them and lots of trees around a couple seem to disappear each trip. Now if you ever make it to the Midwest let me know and we can hit up what is know as the driftless area which is what IA’s trout streams are considered. Thank you Rob, really appreciate the comment, if not the people and the environment, what else will there be left? I just started tying my own Tenkara flies and i am having soooooo much fun! i got my 8-year-old involved and he was just as excited as me – this is awesome though! the gentle, natural, planet-nurturing feel of Tenkara is a big draw for me. Austin, thanks for the comments. It is comments like that that make this feel a job worth doing!